In our family, summer means tomatoes and lots of them. We try to come up with new, inventive ways of using up the tomatoes from our garden, but this recipe dates back a generation. Grandma’s favorite, this recipe is a simple and delectable go-to at the Ohm home. 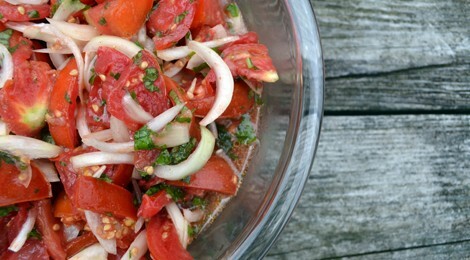 Cut tomatoes into bite-sized wedges and combine with onions in a bowl. Coarsely chop basil and add to tomato mixture. Drizzle olive oil until salad is coated, and add salt and pepper to taste. Put in fridge for at least 2 hours to marinate (we leave over night), and serve.